Wow, Christmas was an eventful one this year. I spent three days baking the week before Christmas then froze everything while I was away on holidays. I came home on the 24th and proceeded to decorate the defrosted goodies and prepare all the canapés for my annual Boxing Day feast and fell into bed at 4am with a whole list of things yet to be done. Spent a relaxing lunch with the boyfriend's family then came home to visit my dad. Then the storm hit. Amidst the biggest hail storm anyone in the area can remember, me and my boyfriend drove to my house to rescue my puppy who was outside in it. He was thankfully not seriously hurt. But when we attempted the drive back to my dad's in time for dinner we found the roads flooded. People were swimming on the road, cars were abandoned after people had tried to drive through them and shorted their cars, trees snapped clear in half and most people were standing out on the street in awe of the swampland that had been clear in the light of a beautiful summer's day only hours before. Apparently there was even a small tornado right near my house, though we never saw it through the hail. Thankfully we found one road in that hadn't been flooded and made it back in time. Phew! Melbourne. She is a crazy place to live. So it was a bit odd the following day when I had mine and my boyfriend's family over for lunch and everything was normal again. As always I made far too much food and filled up every corner of stomach present in the house. It was lots of fun to make everything and lovely that everyone was so appreciative. I have so much to show you guys. Today I'm going to start with this. Some months ago I had an idea for a Christmas cake I really wanted to try. I had no idea how to do it or if it could work as I'd never seen it tried before. Oh well, only one way to find out! Outside the cake is a white Christmas scene. 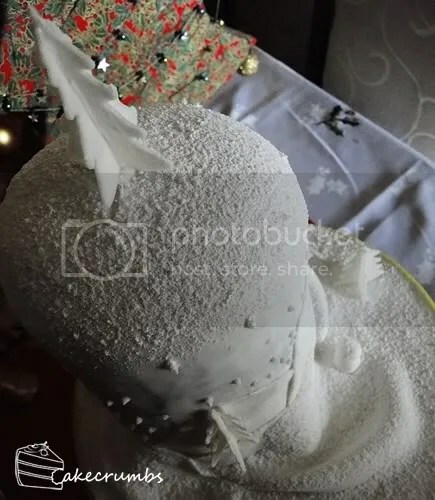 The cake is covered in marshmallow fondant and royal icing trees, with royal icing snow piped onto the cake and then finally dusted in pure icing sugar. I left the snowman without adornments as I wanted everything pure white outside. The cake is a chocolate mud cake with a white cake tree inside. The idea initially was to have the tree inside pure white. However, I baked the white cake as cupcakes to save time and the golden crust destroyed any dreams I had of a pure white tree. What I should have done was bake it as a whole cake then cut off the crust. Next time. I processed the white cake into crumbs then folded in enough cream to give it a truffle-like consistency. I loved the flavour of the white cake so much more than the chocolate, it was really yummy. 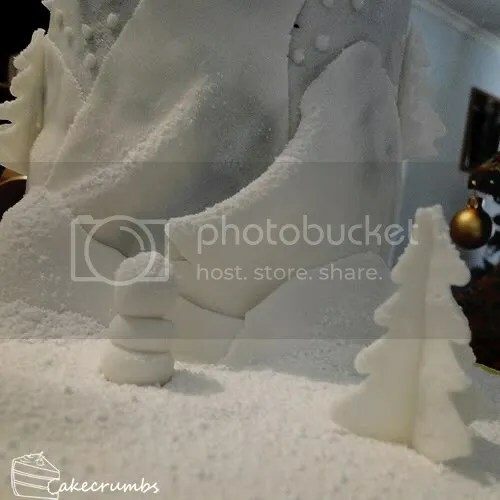 The idea is to have the silhouette of the tree no matter where the cake is cut. 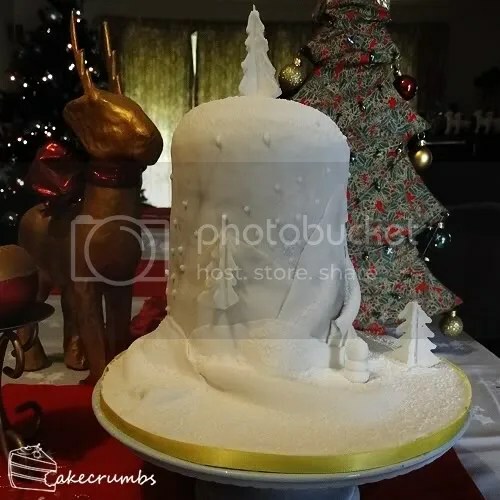 The symmetry of the top layer differed slightly based on where it was cut, and the silhouette could have been nicer, but it was at least recognisable as a Christmas tree so that was a huge relief. 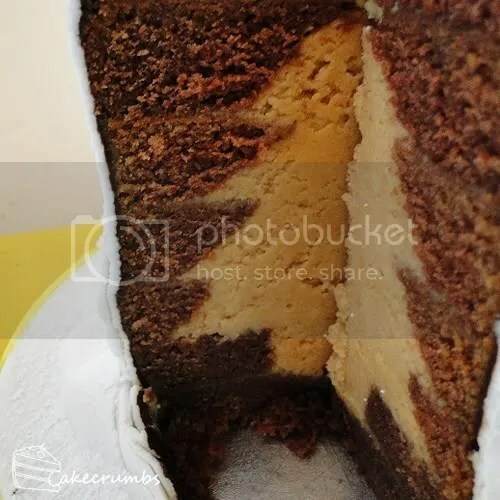 I had no idea if the centre would crumble apart, if the mixture had filled up the centre entirely, or if the shape would even be remotely there. When I saw this I breathed a huge sigh of relief! 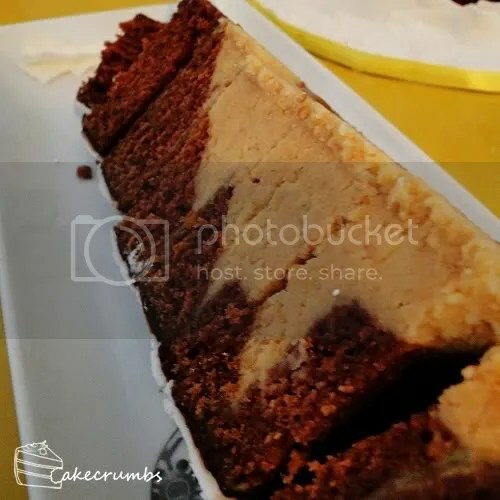 Here are the two cake recipes I used. 1. Preheat oven to 180C (350F), grease and line your baking pan. Cream together the sugar and butter. Beat in the egg one at a time, then stir in the vanilla. Mix in flour and baking powder; stir in the milk until batter is smooth. Pour or spoon batter into the prepared pan. Bake for 30 to 40 minutes for a cake, or bake 20 to 25 minutes for cupcakes. Cake is done when it springs back to the touch. The cake looks lovely! I’ve been meaning to make the chocolate cake but I noticed something. In the ingredients of the chocolate cake you didn’t mention any baking powder or how much too use. So i was wondering, how much baking powder should I (and others) use for that recipe? This is such an awesome cake! I only discovered your deviantart the other day and I am just so inspired by you! Thank you so much for posting all of this delicious food! I really want to try this for myself. 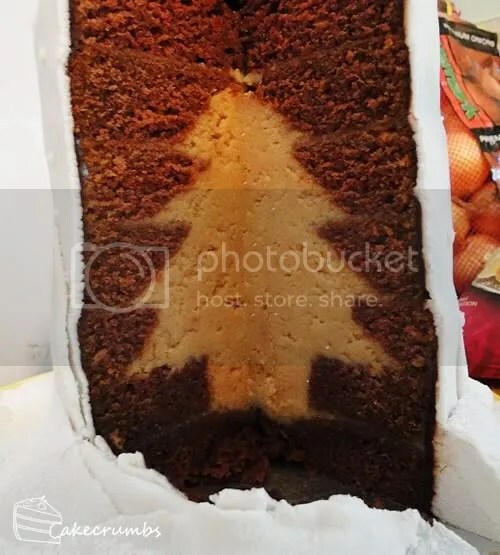 May I ask what kind of cake pan you used and how you managed to get the tree inside of the cake? I think for this is just baked a sheet cake and used round cutters to get the sizes. I cut each layer separately then carved the appropriate sized v-shape inside each later before assembling. Just staring at your cake for a few minutes fantasizing the diabetic coma. That is the most awesome cake ever. and putting the tree inside – wow. teacher. These same kids often are very strong right-brained learners, so why not rely on a strength instead of a weakness to help them remember the words. Our libraries and programs encourage children to explore, think, discover, and learn.